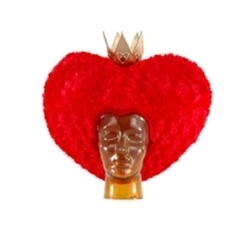 This deluxe, heart-shaped red queen features a swirl faux-fur fabric and a gold lamé crown complete with red jewel accents. Includes a zipper pocket so hat can be stuffed for ideal shape. Fits up to 60 cm heads (23.5 inches).